Saskatchewan is one of the sunniest places in Canada, so it makes sense to use solar energy. But how does it work? Phil Foster and Brent Veitch of Rock Paper Sun took the time to explain how solar panels work – and how to use them most effectively. 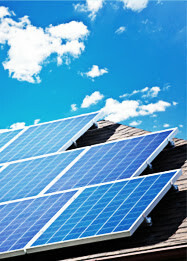 The most common use of residential solar panels is for creating thermal energy. In other words, they help to provide you with hot water. Glycol (antifreeze) circulates through the solar panel(s) and is warmed by the sun. The heat is then transferred to a water storage tank, pre-heating the water that enters your hot water heater. Two thermal energy panels can meet the needs of a family of four or five. They’ll provide an annual average of 50-70% of your thermal energy needs and will heat your water 100% in the summer. In fact, there’s a device to lower the temperature if it heats up more than would be comfortable. Solar panels are an effective way to heat water in our homes as we use hot water on a year-round basis. The University of Saskatchewan and the City of Saskatoon take advantage of solar panels to heat some of their indoor swimming pools. Heating a backyard swimming pool this way isn’t very effective as they are only operational for a few months each year. There are less expensive seasonal solar collectors that can be used to heat an outdoor pool, but they need to be drained to prevent freezing. 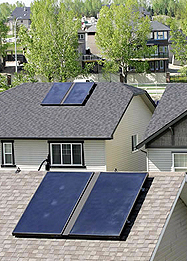 Approximately 100 homes in Saskatoon have installed solar thermal panels. There are only a dozen homes in Saskatoon with solar electrical panels, which operate very differently from thermal panels. Each panel functions like a rechargeable battery. When the sun shines, the panels collect electrical energy. An inverter transforms the electrical charge from DC to AC so that it can be connected to your home’s electrical panel and become part of the system that provides electrical power to your home. 1. Solar panels work most effectively on a south-facing roof, but there is some flexibility. Your exposure can vary by 45 degrees from true south, and it’s also possible to use east- or west-facing roofs. You’ll need to take into account shading by tall trees or buildings. 2. The electrical utility treats residences with solar electrical panels as power producers and, depending on where you live, provides differing forms of compensation for the power you contribute to the grid. If you live in one of the older parts of Saskatoon, Saskatoon Light & Power is responsible for the electrical system. They will purchase your surplus energy and reimburse you at approximately 80% of its retail value. If you live in a newer neighbourhood, SaskPower is responsible for the electrical system, and they employ a net metering system. They will only charge you for the electricity you consume over and above what is provided by your solar panels, but they will not compensate you for any excess power that you contribute to the grid on an annual basis. If you consume 7,000 kilowatt hours (kWh) and produce 6,000 kWh, you will only pay for 1,000. But, if you produce 8,000 kWh and only use 7,000, you will not be reimbursed for the surplus power that you contributed to the provincial grid. Wherever you live, you will pay the basic infrastructure charge of approximately $20. 3. The size of your roof will also influence how many panels you can install. And it’s a good idea to make sure your roof is in good condition before installing solar panels. 4. Finally, you’ll need to consider your budget. How many solar electrical panels can you afford to install? Your solar installation company will be able to model how much energy your potential system will produce and compare it to your current electrical usage. In general, for every one kilowatt of solar power that you install (under optimal conditions), you will receive 1.5 MWh per year. Solar electrical panels are expected to last up to 25 years, but it’s hard to know for sure as the technology is so new. Surprisingly enough, they are more efficient when it’s cold. Rock Paper Sun recommends placing solar panels directly on the roof as placing them at an angle (racking) requires engineering and higher construction costs to ensure they are stable. If you are building a new home and have not yet finalized your plans, consider setting your roof or your solar panels at a 52 degree angle as this will provide the optimal angle for collecting solar energy. The cost of solar electrical panels has been decreasing, but the cost of labour has increased. It will take 20 or more years before your system is paid off. In addition, the energy needed to manufacture the panels offsets the benefits. Residential property owners can currently apply for grants to help subsidize the cost of installing solar panels. The Saskatchewan EnerGuide for Houses and the federal ecoENERGY Retrofit programs will provide a combined grant of $2,250 for a solar domestic hot water system. The work must be completed and evaluated before March 31, 2012, for the $1,250 federal portion of the grant. The $1,000 provincial grant is available until October 31, 2013. The provincial Net Metering Rebate Program, administered by the Saskatchewan Research Council, has been extended. The program will reimburse up to 35% of the cost of photovoltaic (solar electrical) installations (up to a maximum of $35,000). You must apply before January 3, 2012, and the work must be completed by August 31, 2012. A number of different companies in Saskatoon provide solar installations. The websites of the Canadian Solar Industries Association and the North American Board of Certified Energy Practitioners are a useful resource as they list the training and qualifications of their members.